Sculpture was historically the domain of the artist-worker, armed with hammer and chisel. Now the artist may use any material and any approach. 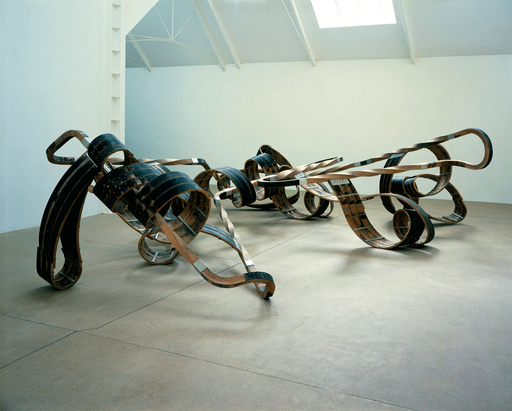 Tony Cragg reflects on the changing role of the sculptor through the work of Richard Deacon. Richard Deacon and I have known one another since the early 1970s. We met through mutual friends, principally Roger Ackling, who taught me at Wimbledon, and Bill Woodrow, who studied at St Martins School of Art with Richard. It was an interesting time. Anthony Caro and his generation had had a great influence in the 1960s, and were then followed by a new generation that included Barry Flanagan, Bruce McLean and Richard Long. 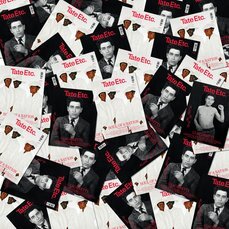 Pop Art was still in the air and the movements of Arte Povera, Conceptualism, Land Art and Minimalism widened the definition of what could be called art and, in turn, sculpture. Artists such as Joseph Beuys and Gilbert & George opened the door for everyone and everything to be declared art. 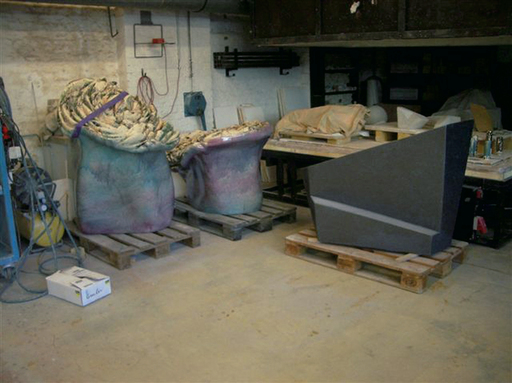 So how did sculptors such as Richard Deacon deal with the ideas of form and content? There are many examples in art history in which the sculptural form is almost a direct, even overt, function of the religious or political views that the artist or patron held. However, the relationship between the quality of these opinions and the quality of the sculpture could not be described as being directly proportional. Whereas this might be clearly apparent in figurative sculpture, it also applies to non-figurative works. As sculpture freed itself from having to use a language gleaned from the meaningful forms of the figure, it started to employ other expressive properties of forms and materials. Part of this still relatively new language was largely attributable to Marcel Duchamp, who recognised that a great deal of our reality is made up of the objects and materials that we produce, and that these objects could be used as the carriers of meaning that the artist ascribes to them. Deacon does not shy away from this approach. He subverts industrial construction materials, for example, or, one might say, even perverts them into sculpture. You cannot sit on his work, drink out of it, or live in it, but he gives it qualities that enable you to look at it and think about it. These qualities are constructive, positive and even optimistic. It is not by chance that Deacon is a sculptor. As an atheist, not believing in an Almighty throws the responsibility back into his lap. Not believing in the Maker and being a maker oneself is more than a simple dilemma. What results is a moral, ethical vision, even if we come from oblivion and eventually return to it. Whatever happens inbetween, and how we comport ourselves, is up to us. As tiresome as it has now become to see BMWs and other industrially produced everyday objects exhibited as sculpture, the readymade has spawned all major sculpture movements in the twentieth century, providing a basis for Dada, Fluxus, Pop Art, Arte Povera, Minimalism and the Brit Art of the 1990s. It has given us an awareness of how we extend ourselves with material and how we meddle with everything: the clothes we wear, the chair, the room, the house, the street, the state of our culture. The intelligent manipulation of material is the key to our survival. 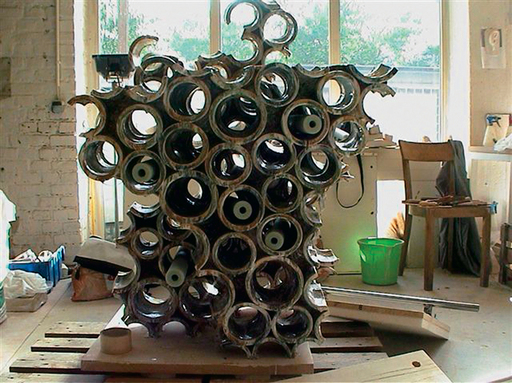 It is also without a doubt that we do not intentionally produce useless things – unless you are a sculptor. In addition, we use rationalised production systems to effect material changes, whatever they may be, as efficiently as possible. The formatting of material is essential for these processes. We now live in a world of utilitarian objects formatted on a level that defines our reality – the brick in the wall, the 2 x 2, the 2 x 4, the bar, the bit, the bite, the mm, the gm, the dollar, the euro, the euro apple, the pixel. Our reality, that which informs us, is made up of useful things. Therefore, utilitarianism is a harsh censor of reality. How so? If the relationship of form and content, not to mention meaning, is central to any discussion about art, then when the form is being limited so is the content and, of course, meaning. Gods, angels, dragons, ghosts, the good and the bad, heaven and hell – all were created long before the media machine got going. These are old forms; who is going to create new, meaningful ones now? At a time when format is often a substitute for form, and content seems to have to be extrovertly political, social, or anti-social, Richard Deacon’s sculptures represent the constructive search for meaning and expression in material – and the fact that making sculpture is in itself a radical and political activity.